Video has taken the Internet by storm in both personal and commercial use. With the increase in bandwidth of Internet connections in households, video has become a mainstay for personal consumption. What that means is that your customers (consumers or businesses) are watching video. In January of 2007 Google announced that they would start showing YouTube video results on their search results pages, which signaled the beginning of Google’s commitment to video. Since then they have increasingly been giving weight to videos and websites with videos, which is a great reason to put a video on your website. Where are you sending your video traffic? You know that you have to have videos on your website but are you doing it the right way? If you’re like most people, you upload your video to YouTube, you embed it in your website, and you figure it will start showing up in the search results. What happens is that you don’t see the video showing up at all or if it does show up, the link is to YouTube. That’s good but not as good as a link to your own site. Enter Google XML Video Sitemaps. Now instead of this video traffic going to YouTube, you can let Google know that the page that has this video is on your website. What’s great about this is that it doesn’t have to be your video for you to start getting results from it. It just has to be embedded on your page. We recently did some work for Final Five Productions, a Detroit Video Company, that has implemented this well. The owner blogs about videos that they’ve done and also on other videos that he wants to review. If you view their video sitemap, you can see the varied videos that are displayed. There aren’t any great tools out right now to make creating video sitemaps truly easy but there are a few tools that can be used as well as just manually building it yourself with Google’s How to Create a Video Sitemap. Tell Google You have a Video Sitemap! 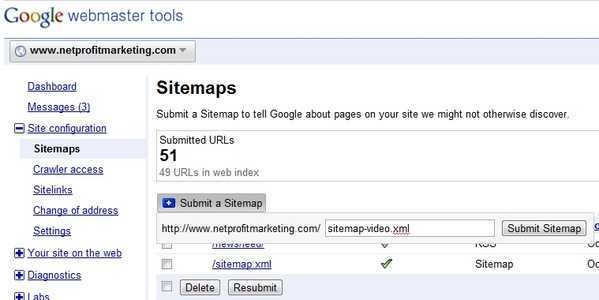 A critical step that is most often missed in creating a video sitemap is in telling Google you have the sitemap. The easiest and most effective way to do this is to create a Google Webmaster Tools account and submit the link to your video sitemap. Video is here and it will help your SEO, traffic on your site, and will help get more sales. Are you taking full advantage of it? Thanks a ton for the shout out! I’ve got a lot of work to do on my site, but your help was beyond measurement! I’m already seeing the positive results, thanks! Should a video sitemap be used if my videos are hosted on Youtube? You should definitely use a video sitemap if your videos are hosted on YouTube. The end result of that will be Google indexing your videos that are embedded on your page and directing traffic to your website instead of just to your YouTube page. In the video results section of Google for my videos (or even other people’s videos that I embed and sitemap on my site), someone will be redirected to my site when they click on the result. Basically Google is letting you have your cake and eat it to by letting you easily host your videos somewhere else but still get credit for them on your website. I have created a video sitemap, submitted it through webmaster tools, and I still only see the youtube version of my video in the search results. This is even when I type in my exact title of the video. My video sitemap was also excepted and all the URLs have been submitted. Why does it still only show youtube’s results? Unfortunately it looks like Google isn’t indexing YouTube videos as coming from sites other than YouTube. In order to get a video indexed in Google, it has to be self-hosted. If you search for Detroit Web Design, you’ll probably find my video from a post I did to test this. The video is hosted at MaxCDN (look for video hosting) or you could use any other video hosting site so you don’t use up all of the bandwidth on your site. So, from what you’re saying, when submitting the video sitemap, under , I should put the URL where my imbedded video is located rather than the URL where it’s found on YouTube, correct? No problem Troy. You actually have to provide both URLs. The video:player_loc tag will point to the YouTube video (usually found in the embed code under src). The loc tag will point to your web page where it’s embedded. Look at the link above to Final Five Productions video sitemap. You can see this if you view the source of their video sitemap. Ive been searching for the answer to which values you should input for with embedded YouTube videos for weeks, and cannot find anyone who has given an answer to the great many people asking this question on tons of websites/blogs. It looks like you guys feel you have cracked it, and after checking out the sitemap referenced above, I believe that I can now find the correct values if http://www.finalfiveproductions.com/sitemap-video.xml is coded correctly…. only problem is, that sitemap has no videos actually listed by Google Video. Those videos are simply not indexed! Are those YouTube values incorrect? I’ve noticed this with some sites and I don’t have a good answer for it right now. I’m looking into the issue and have also consulted with Joost de Valk (WordPress plugin guru) about the issue. It seems to be trying to find out what Google wants to see in the Sitemap so I will update when I get an answer. In the meantime, you can reference Google’s information on video sitemaps: http://www.google.com/support/webmasters/bin/answer.py?hl=en&answer=80472. The video:player_loc or the video:content_loc are required but should not be the same value. It looks as though the best one to use if you are working with an embedded video is the video:player_loc. In this case you will usually grab the embed src=”” tag from the embed code. YOUTUBE UPDATE: There does not appear to be a fix for the YouTube issue. One guy on another website said he heard, straight from the Google Sitemap MD’s mouth just a few weeks back, that they are still working on it and hope to have a fix in the coming months. But there is no answer, because the link needed does not come up in YouTube embed codes/source code, due to whatever way they program it, so you cannot find the .swf file which is neccessary for the sitemap. The link in the sitemap you show is incorrect…. a correct link will give you the player alone filling your browser (see this DailyMotion link http://www.dailymotion.com/swf/xemen5). Apparently, they will always look like that! Just the player – full screen. Hopefully YouTube/Google work it out. They are owned by the same company now so they should be able to work it out somehow. The URLs for my video:player_loc do show the video player full screen but it seems as though it may still be the wrong link because the example on Google’s site shows a .swf extension for a YouTube video, which I can’t find anywhere. Hopefully they get that fixed soon. Thanks for the info! as stated by Damien, google is having trouble to index embedded youtube videos. But I don’t see why they should actually fix it, so far it’s better for google to drive traffic to youtube.